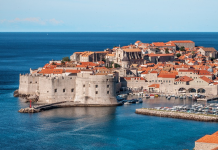 Last week, we introduced you to a new travel log series written by our guest blogger and fellow sailor, Georgina Moon. Georgina, who after spending a fantastic Carnival in Lefkas, is now on her way to discover more beautiful towns and coastal villages on the Greek island of Lefkada. 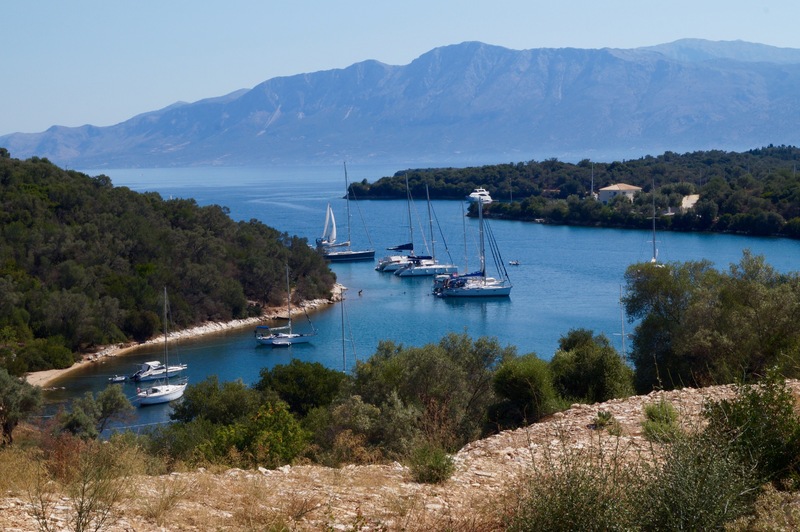 Join Georgina in Part II of her summer travel log to get some tips about anchorages and dining for your next Zizoo boat holiday spent sailing around Lefkada. Before leaving Lefkas behind, we stocked up at the nearby supermarket with provisions and filled up the water tanks on the boat. Although Fandancer is a good size for two people – she is 40ft long (11 metres) – but she does not hold a huge amount of water, so we need to fill her tanks every 6-7 days. We also carry two full containers of fresh water on deck. We headed to the island of Meganissi and tucked ourselves into a quiet bay by dropping the anchor and taking two long lines ashore so Fandancer did not swing. We were able to swim off the boat, but we could also take the dinghy ashore. One lunchtime we followed the path to the tavern at the head of the bay. The next morning I walked over the hill to Vathi, the main harbour town on Meganissi. We also walked a little further the next evening to the hill town of Katomeri, where we came across a very old lady working on an ancient loom. She was making very fine linen tablecloths and cushion covers. I was happy to buy one from her, as she didn’t mind me taking photographs. Also last week we visited two more mainland harbours, at Paleros and Mitikas, both an easy hop from Meganissi. 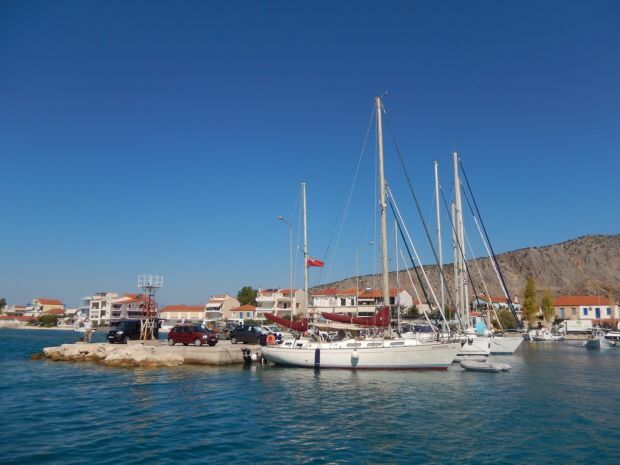 Paleros is one of our favourite sailing destinations. The harbour usually has plenty of room for visiting yachts, but it was quite busy when we got there – luckily we managed to secure the last space. There is free water available on the quay, and we took the opportunity to fill up our water tanks and wash down the decks. At the end of the quay, there is a beach bar with comfy sun loungers, which is a lovely place to spend the afternoon. Paleros has a number of tavernas along the seafront, and our favourite has an Indian chef. Whenever we are in Paleros, we head there for a curry. After we’ve been sailing in Greece for a couple of months, it is a treat to have something different from a Greek salad and moussaka! This week we also found the last space on the harbour at Mitikas. Our yacht Fandancer is 43 years old, and unlike many modern lightweight yachts, her weight often means that she is difficult to steer astern. Tim had to ensure that he had lined her up in exactly the right place, about three boat lengths from the quay before I dropped the anchor. The wind was on her beam, which meant that she kept drifting out of position, and it took a couple of attempts before we came back in smoothly. Usually, there is someone on the quayside to help you with your stern lines. We have always found other cruisers to be friendly and helpful, and we have met some lovely people from all nationalities on our travels around Greece. Are you interested in going on a boat holiday in Greece this year? Check out our fleet or contact one of our boat experts and tell us what your perfect holiday looks like. 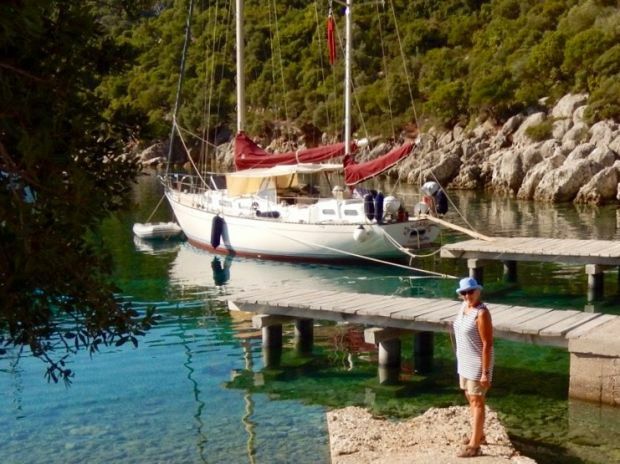 You can also get more tips and learn about cruising life in Greece as told by Georgina here. Happy sailing! Next articleCruisers’ stories: Can you afford to sail?